Modern Standard Arabic is the official language. Tamazight is spoken by one third of the population and has been recognized as a "national language" by the constitutional amendment since 8 May 2002. Algerian Arabic (or Darja) is the language used by the majority of the population. Although French has no official status, Algeria is the second Francophone country in the world in terms of speakers and French is still widely used in the government, the culture, the media (newspapers) and the education system (since primary school), due to Algeria's colonial history and can be regarded as the de facto co-official language of Algeria. The Kabyle language, the most spoken Berber language in the country, is taught and is partially co-official (with a few restrictions) in parts of Kabylia. Àlgéríà (Arabiki: الجزائر, al-Gazā’ir), fun onibise Orile-ede Olominira Toseluarailu awon Eniyan ile Algeria, je orile-ede ni Ariwa Afrika. Ile re ni ti orile-ede ti o tobijulo ni Okun Mediterraneani, ekeji totobijulo ni orile Afrika leyin Sudan, ati ikokanla totobijulo lagbaye. Algeria i bode ni ariwailaorun mo pelu Tunisia, ni ilaorun pelu Libya, ni iwoorun pelu Moroko, ni guusuiwoorun pelu Apaiwoorun Sahara, Mauritania, ati Mali, ni guusuilaorun pelu Niger, ati ni ariwa pelu Okun Mediterraneani Sea. Titobi re fe je 2,400,000 square kilometres (930,000 sq mi), be si ni iye awon eniyan re je 35,700,000 ni January 2010. The capital of Algeria is Algiers. Algeria je omo egbe Iparapo awon Orile-ede, Isokan Afrika, ati OPEC. Bakanna o tun kopa ninu dida ikoenu owo Isokan Maghreb. ↑ Department of Economic and Social Affairs Population Division (2010) (PDF). Population and HIV/AIDS 2010. United Nations. http://www.un.org/esa/population/publications/population-hiv2010/population-hiv2010chart.pdf. Retrieved 12 February 2011. ↑ 4.0 4.1 4.2 4.3 "Algeria". International Monetary Fund. Retrieved 12 April 2011. ↑ "Human Development Report 2010. Human development index trends" (PDF). The United Nations. Retrieved 10 November 2010. 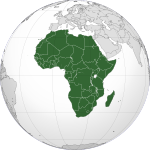 ↑ "Africa: Algeria". CIA World Factbook. Cia.gov. Retrieved 2009-12-07. ↑ "Population et Démographie". Office National des Statistiques. Retrieved 2010-03-13. Àtunṣe ojúewé yi gbẹ̀yìn wáyé ni ọjọ́ 7 Oṣù Kẹta 2013, ni ago 17:37.